Nature Unassisted by Art features work by Sarah Munro and Frank Schwere. 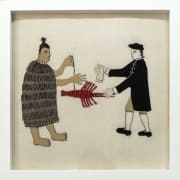 Sarah Munro’s Trade Items consists of a series of delicately embroidered works that respond to a watercolour and pencil drawing of ‘first contact’ by Ra’iatea navigator Tupaia in 1769, depicting the exchange of a crayfish for a length of cloth or tapa. Frank Schwere’s photographic series captures Munro during a research expedition to Dusky Sound, working on the shore of Pickersgill Harbour, an anchorage used by Cook’s vessel, the Resolution, during his second voyage to New Zealand. The title of this exhibition is taken from a quote by Georg Forster, a scientist who took part in James Cook’s second voyage to the Pacific and refers to his first impressions of Dusky Sound after months at sea without sighting land. Sarah Munro (b.1970) was born in New Zealand and studied at Elam School of Fine Arts at the University of Auckland, majoring in sculpture. Since completing a Doctorate in Fine Arts in 2005, Munro has worked as a lecturer and tutor, and has been the recipient of artist residencies including the Frances Hodgkins Fellowship at the University of Otago. 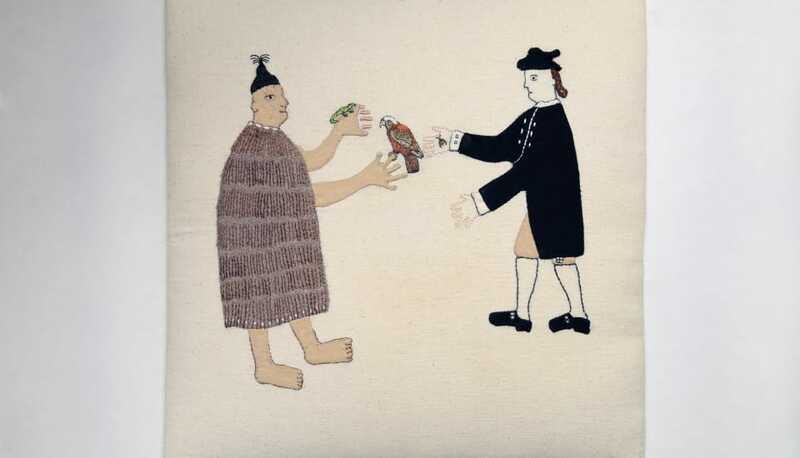 She has exhibited throughout New Zealand in both public and dealer galleries and her work is held in national public and private collections. Frank Schwere (b. 1966) was born in Germany where he studied Fine Art and Photography in Stuttgart before moving to Berlin. In 1997 he moved to New York to attend the International Centre of Photography. He lived in New York for twelve years, working as a commercial photographer while also pursuing his own personal projects, before relocating to New Zealand in 2008.